Nearly a half-century after humans first set foot on the moon, NASA is moving forward with plans that it says could put astronauts back on the lunar surface in less than a decade. The approach will be different than during the Apollo program, relying on international and commercial partnerships in hopes of flying missions faster, more affordably and more often. 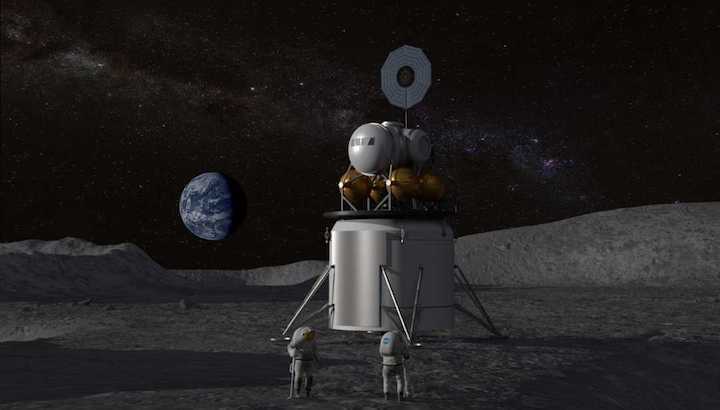 In Washington, D.C., on Thursday, the space agency met with industry representatives who in May could be awarded initial six-month studies of a lunar landing system. The optimistic goal: Land up to four astronauts on the moon for a weeklong stay as soon as 2028. NASA envisions three basic pieces to the human landing system. The first, a descent module, could launch a demonstration flight landing on the moon in 2024. Next, a reusable tug would be added to move crews back and forth between NASA’s planned Gateway — a small space station in orbit around the moon — and near the surface. And an ascent vehicle would enable crews to rocket away from the surface and get back to the Gateway. Those two pieces could be tested in 2026, with astronauts following in 2028 if all went according to plan. This July, the world will celebrate the 50th anniversary of Neil Armstrong and Buzz Aldrin landing on the moon during Apollo 11. From the Gateway near the moon, astronauts would return to Earth in the agency’s Orion capsule. NASA hopes to launch Orion on an uncrewed test flight around the moon in 2020 or 2021, flying from Kennedy Space Center atop the Space Launch System rocket. The new lunar program has emerged from Space Policy Directive 1, President Trump's order directing NASA to return humans to the moon, then on to Mars. Study proposals for the lunar landers, due March 25, will focus on the descent module, tug, and ways to refuel reusable tugs and ascent vehicles. How much might a human lunar lander cost? NASA didn’t say. The funding outlook does not assume an end to direct support for the International Space Station in 2025, as the Trump administration has proposed. With its new moon strategy, the agency is trying to apply the sorts of commercial partnerships that are successfully resupplying the International Space Station in low Earth orbit, and which this year could begin flying astronauts there. In a related program, NASA said it would soon announce a dozen science instruments or technology development payloads that it will attempt to fly to the lunar surface on small, privately developed robotic landers. A contract is expected to be awarded next month for a mission that could fly as soon as this year or next year. “We’re going to be able to explore and learn more than we did during the Apollo years,” said Bridenstine.